Featuring a prime downtown location, The Ritz-Carlton, Denver blends modern design with natural materials, and views of the Rocky Mountains. The hotel's Club Level has dedicated concierge services, and the spa recently added a new hair and nail salon. For dining, ELWAY'S Downtown, owned by NFL Hall of Famer John Elway, provides a signature steakhouse menu infused with the spirit of the mountain city. Continue reading below the restaurant photo. Convenient to major attractions like the Denver Zoo, Larimer Square shopping, and Coors Field, The Ritz-Carlton, Denver offers a central location for families to explore the Mile High City, while enjoying a variety of on-site amenities. Read more about three of the top family-friendly amenities at the hotel below the photo. This Ritz Kids program brings the outdoors inside with an in-room indoor tent for sleeping and playing, as well as a Colorado wildlife story book, plush lion stuffed animal, coloring activity, and choice of a S'mores cupcake or sliced apples, nuts, and hot caramel sauce. Please note: Ritz Kids City Camper packages available in One Bedroom Suites and Deluxe Suites, and can be arranged via the hotel's guest relations team. Young travelers are greeted with a welcome gift at check-in, that includes an activities book and scavenger hunt. There's also a children's menu with kid-friendly choices at Elway's Restaurant. Planning a getaway with the children before new baby arrives? The hotel's spa offers a variety of Mommy-To-Be Services for pre-baby pampering, as well as snacks. Plus, the spa offers Ritz Kids Spa treatments with age-appropriate pedicures, facials, or hair styling for special Mommy-and-Me time at the spa. With four beautiful seasons of scenery and activities, Denver makes a great weekend getaway at any time of the year. But autumn at The Ritz-Carlton, Denver is top on our list. Offering an ultra-luxe setting in the heart of the Mile-High City, in the scenic Larimer Square, the luxury hotel is close to the Denver Convention Center, as well as boutique shops and upscale restaurants. Blending modern design with natural materials, the lobby has a breathtaking glass-blown chandelier, and guest rooms have plush interiors and spacious bathrooms with marble bathtubs. In addition to the city's natural beauty, and visiting must-see attractions like the U.S. Mint, here are two can't miss autumnal experiences at The Ritz-Carlton Denver. Read more below the photo. Named after legendary Denver Bronco's hall of famer, John Elway, the hotel's signature restaurant is a six-time recipient of the Award of Excellence from Wine Spectator Magazine. 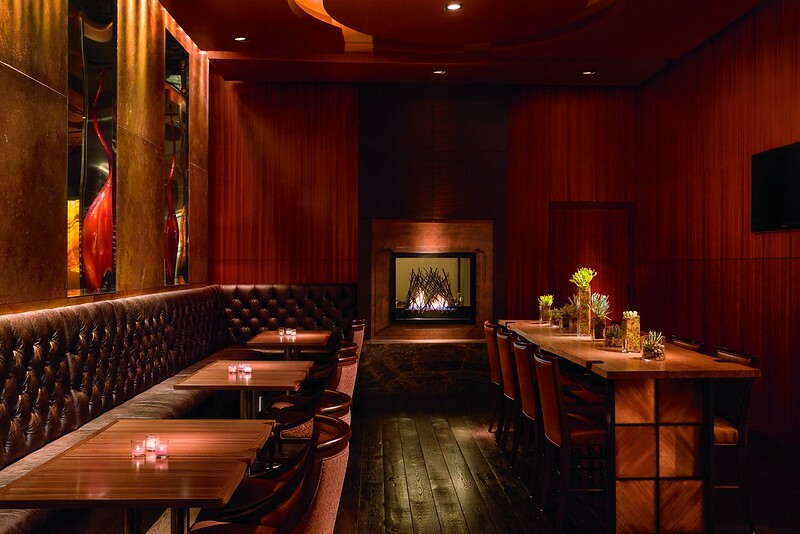 Part of downtown Denver's innovative dining scene, the menu features the finest meats including ahi tuna and tender Buffalo ribeye, in an elegant dining room inspired by the American West with supple leather furnishings, wood accents, and an impressive wine wall. During football season the restaurant offers the "Game Day" Brunch Buffet with a home team-inspired spread that includes USDA prime steak & potatoes, breakfast burritos, pastries, and bottomless Bloody Mary or Mimosa options. Continue below the photo. Love all things pumpkin spice? Get ready to take it to the max with this pampering package. The session begins with a 50-minute aromatherapy massage, followed by a 50-minute Pumpkin Enzyme Facial. Then it's time for a Pumpkin Spice Pedicure that begins with an apple cider soak, followed by a honey sugar scrub and pumpkin spice mask for the toes. To top it off, guests are given a warm "Pumpkin Spice" cocktail to sip and savor during the experience. Read more below the photo. Guided historical tours recounting interesting anecdotes about the general history of The Brown Palace Hotel are offered every Wednesday and Saturday, and in October, the tours focus on the hotel's ghostly past. This popular tour highlights tales of unexplained phenomena and spirits who appear to have chosen to spend eternity at the hotel. - A formally-dressed string quartet is said to live in the hotel's main dining room and has been allegedly heard to be practicing thier music. The room was formerly known as the San Marco Room, where big bands played. - A man dressed in an old-fashioned train conductor's uniform was seen at the site where the hotel's railroad ticket office used to be.